Nowadays, smartphone palys an important role in our daily. It not only meets the requirements of communication, but also provide many other tasks we can live out, including gaming, social networking, taking photos. Generally, we will store a lot of private data on the phone like contacts, pictures, music, note, and so on. Some times we accidentally delete the items and we need to figure out a way to recover it. The data lost would lead to great troubles and unhappiness. The truth is that people still often lose data on mobile phone's internal memory including contacts, Messages, call history etc.. There are many reasons that would lead to data lost: pulling out memory card without shut downing the phone, accidental deletion, formatting, mistaken partitions of data, etc. If we accidentally lost data in Android internal memory, what should we do? Android phone are generally designed to stop direct access to internal memory. But behind the scenes, nearly all Androidl phones organize their data in the same file structure. If you use the phon improperly either due to lake of information or because of your careless nature, eventually you're end up getting losing your vital data on this device. The principle of internal storage is based on binary encoding. And then smartphones can interpret the encoding. Therefore, when people delete data, they only delete the virtual pointer to the data. In fact, the data is still on the device and thus recoverable.But it is still possible to retrieve lost data from Android internal memory. Please read more on next section. 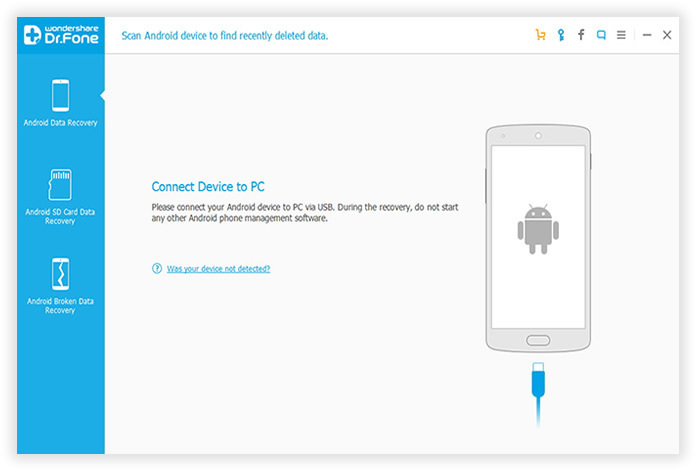 There are many Android file recovery programs you can find out on Internet. It is really hard to determine which one is the best. 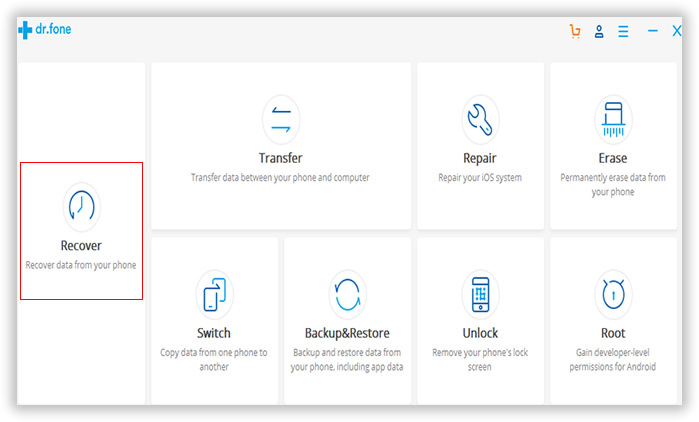 To be honest, Androidphonesoft Android Data Recovery is currently an advanced tool you should have if you want to rescue deleted files from internal storage of Android phone. It can recover all kinds of files from Android internal memory including contacts, SMS, photos as well as other types of data. You have the chance to preview deleted files before recovery. This is really a huge advantage over other similar programs because there is no need to recover all the data, which takes a lot of time. Once you have installed the software, follow the instructions below to learn the tutorial. Before making any action, make sure you've properly installed the program on your PC by clicking the download link above. This program has a set of useful tools. For data recovery, please click "Recover" button first. Now, you need to connect your Android device to your computer via USB cable. In order to make the program to access your Android phone's internal memory, you need to turn on USB debugging on your Android device. 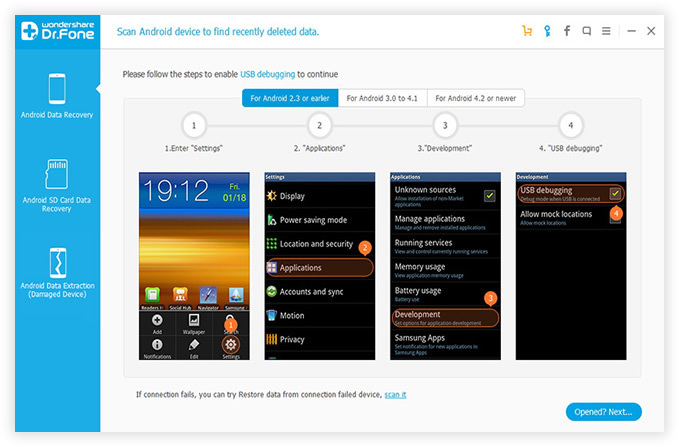 For different Android system, here we provide several methods to fast access USB debugging mode. 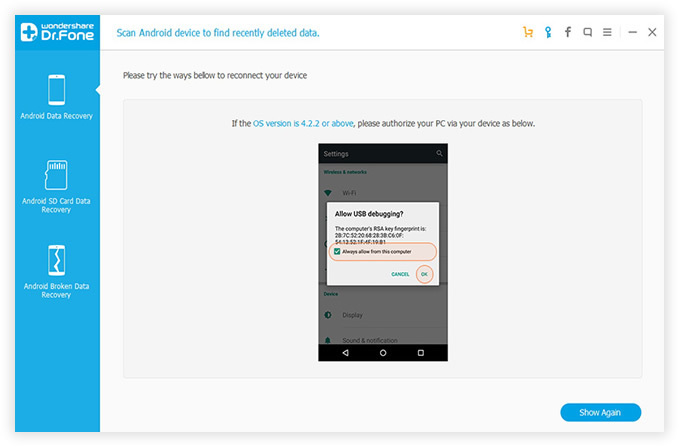 When enabled the USB debugging, the program will automatically detect your Android phone then deep analyze and fast scan all lost or deleted data on your Android phone's internal memory or SD storage. Next, look at your phone's homescreen to click the "OK" allow the program super user authorization when a Superuser Request pops up. Then click the "Start" bottom to start scanning. The whole scanning process will take a few seconds based on the size of your data, so be patient! Make sure that the battery is more than 20% before you start. 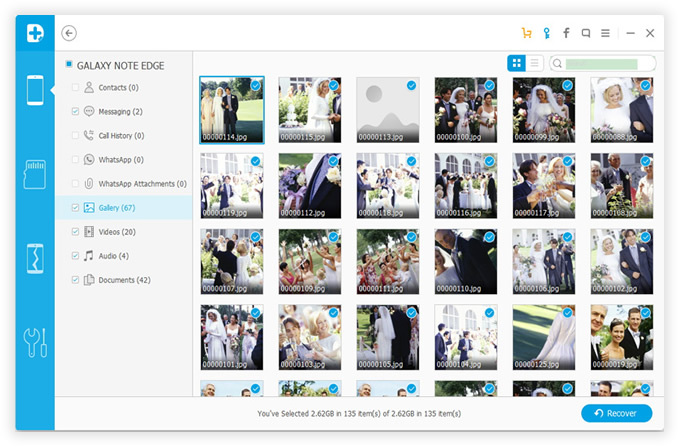 When scanning completes, all scanned data will be showed in well-organized categories. Both deleted and existing data are displayed, and the red color represents deleted data. Preview them and select the one you need to recover. Navigate a path on your computer to save the recovered files. As Android phones gradually play a more and more significant role in people's daily life, data storage and protection also become much more important. There may tons of reasons causing you lost data on Android internal memory. Despite all this, Android Data Recovery program will unquestionably be your best assistant to help you restore and protect importance data. It is characterized by its outstanding factions and various advantages. Its major features including: supporting all formats recovery, rapid scanning speed, and high-quality recovery effect, high recovery rate. 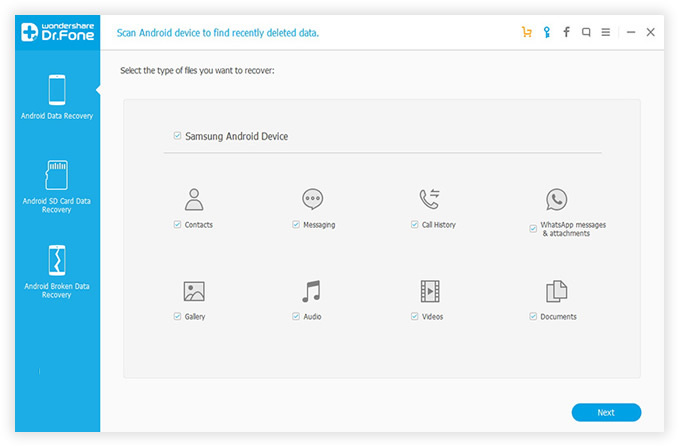 Ultimately, analyzing and save your valuable data from Android internal memory.